I have struggled these last few weeks of my first Semester on the MA, I’m not entirely sure why. More often than not it involves wrestling with the ugly spectre that is self-doubt. I have produced a lot more than I am including here, much of it is the product of a fairly exhausted mind. So I’ve had a break over Christmas and I am trying to think more carefully about what I want to draw. 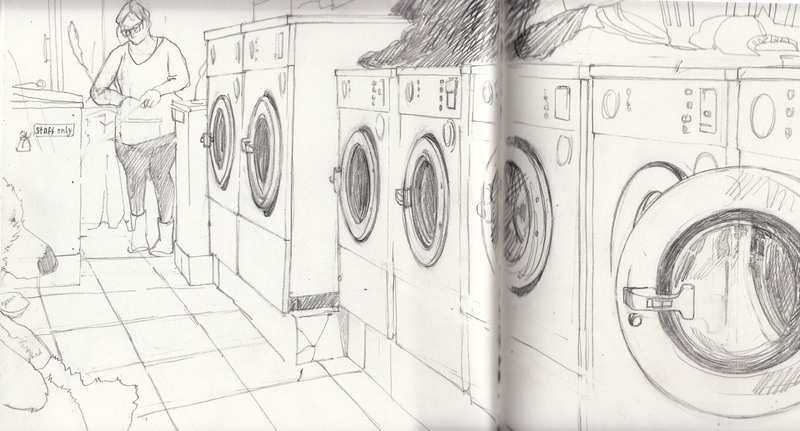 The launderette proved a unexpectedly joyful place to draw, warm and busy and filled with the small of washing powder and the comforting sound of the machines. The teddy that you can just see to the left is one that I was having washed for my son’s Christmas present. He (the teddy bear not my son) was found in a charity shop for £2 and has turned out to be a fine example of a bear once he had his silly hat and bow taken off. I think it might be worth going back there to draw again, using tone and some colour just for the bear. The image has a narrative in it. A bear in a launderette – you have to wonder why he’s there… (Oh, and lets hope my son doesn’t read this before he stops believing in Father Christmas….). The Butcher’s shop was drawn today, from the comfort of my car, so I could sit in the dry and also use acrylic, using the passenger seat as a table with a board across it. First time I’ve done that, and rather successful. I am quite pleased with the result because I don’t generally like to draw buildings, however that one has been calling out to me for a while now. I like the coloured tiles and of course, the historical nature of it. 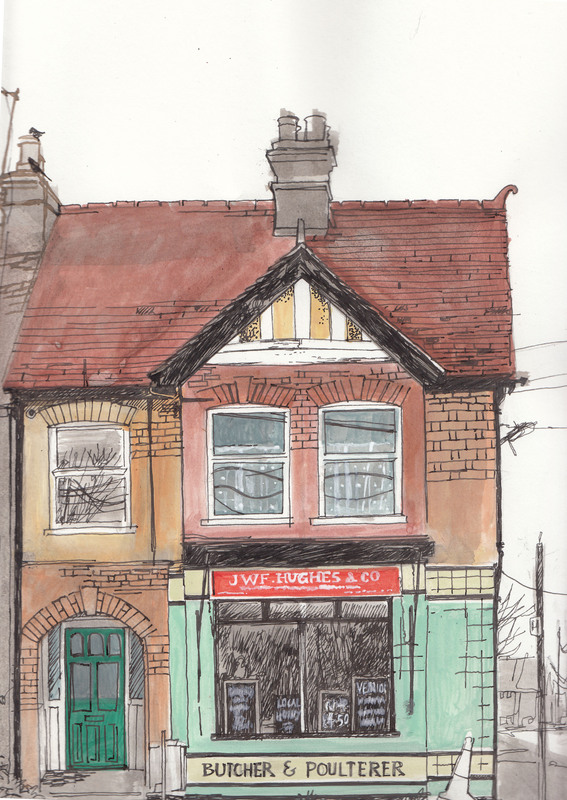 It’d be good to go back and draw in better weather, when the shop is open and joints of meat are hanging in the windows. The drawing falls short of my expectations for it, as ever… but I would welcome opinions from readers of this blog as to whether each and every brick and tile should be referred to for the drawing to appear more complete. 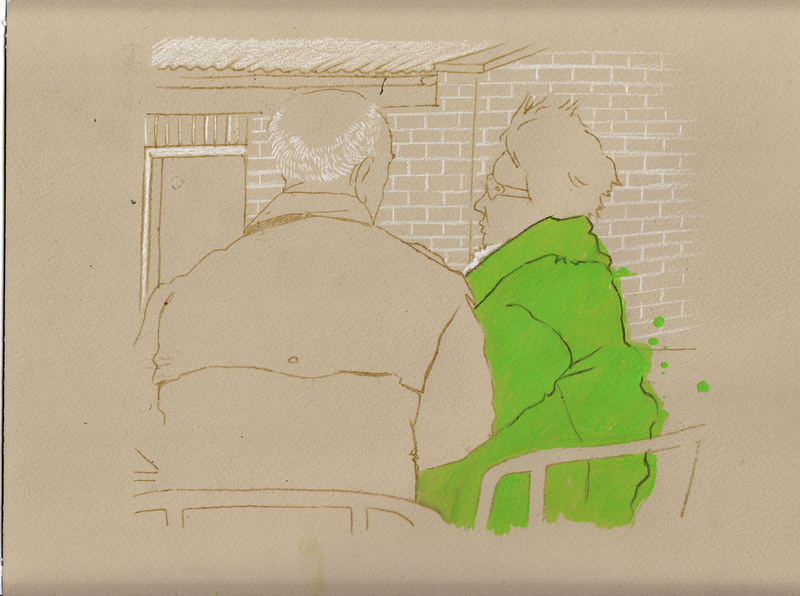 The images below are ‘re-draws’ of other drawings that I have done elsewhere in the project (included on here) and just exploring a kind of home-made mono-printing technique, simple line and the graphic use of flat, unrelated colour. 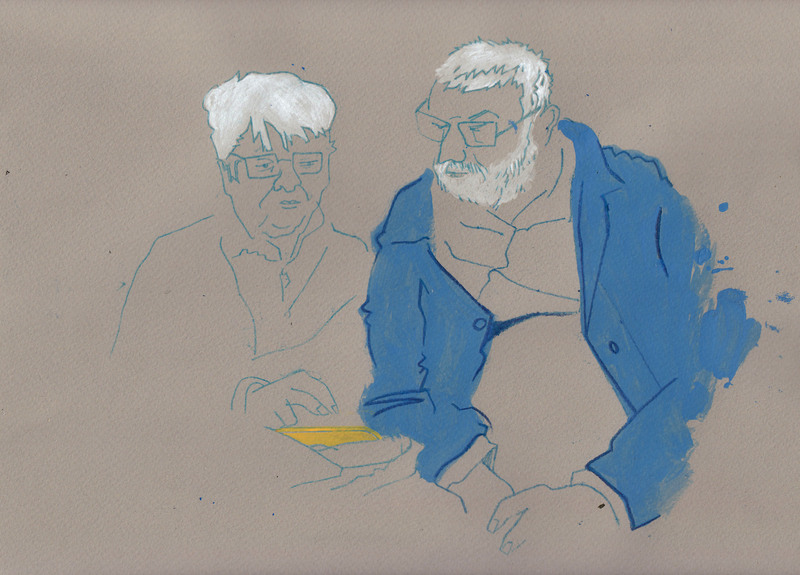 I quite like them but now want to explore drawing people with greater depth, the key is tone – yet it’s hard to do on location, so lets see what happens as we move toward the second semester, beginning in February. 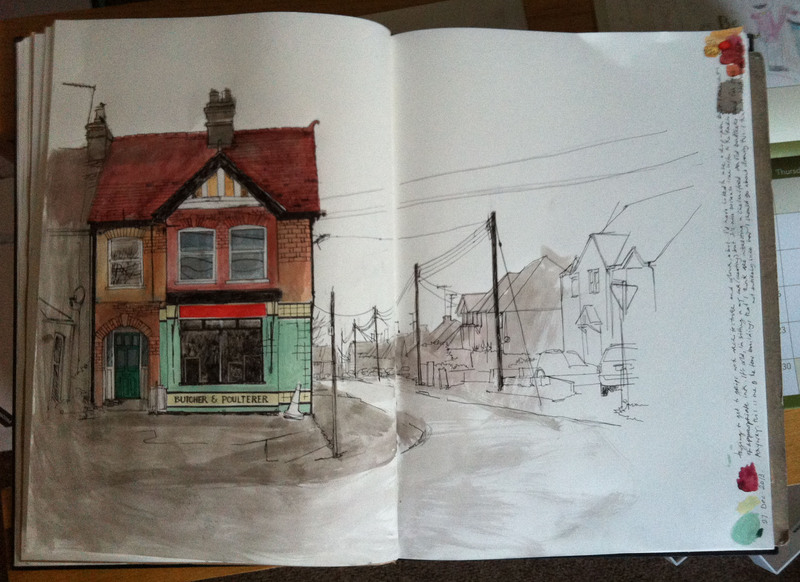 In the meantime I must soon hand my sketchbooks in for assessment. It still seems to me that I am still doing mainly technical exercises and trying to test my abilities. 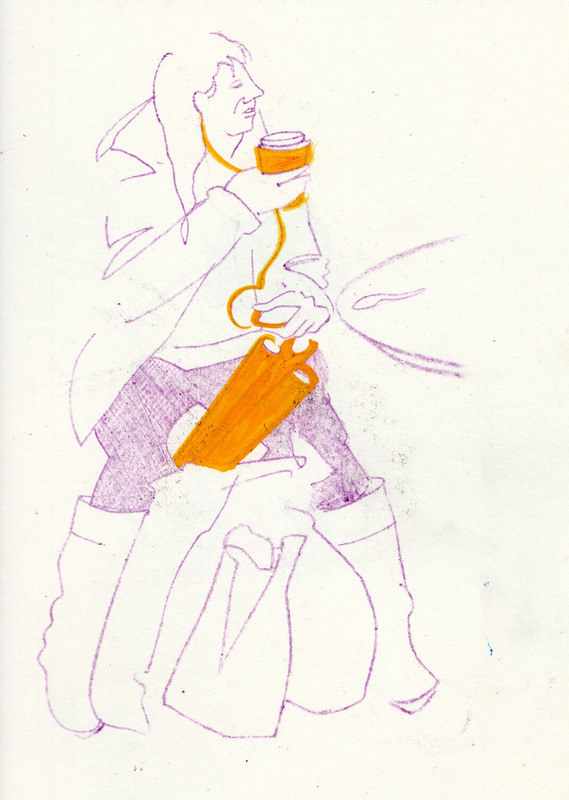 I am still looking for the passionate thing to draw. 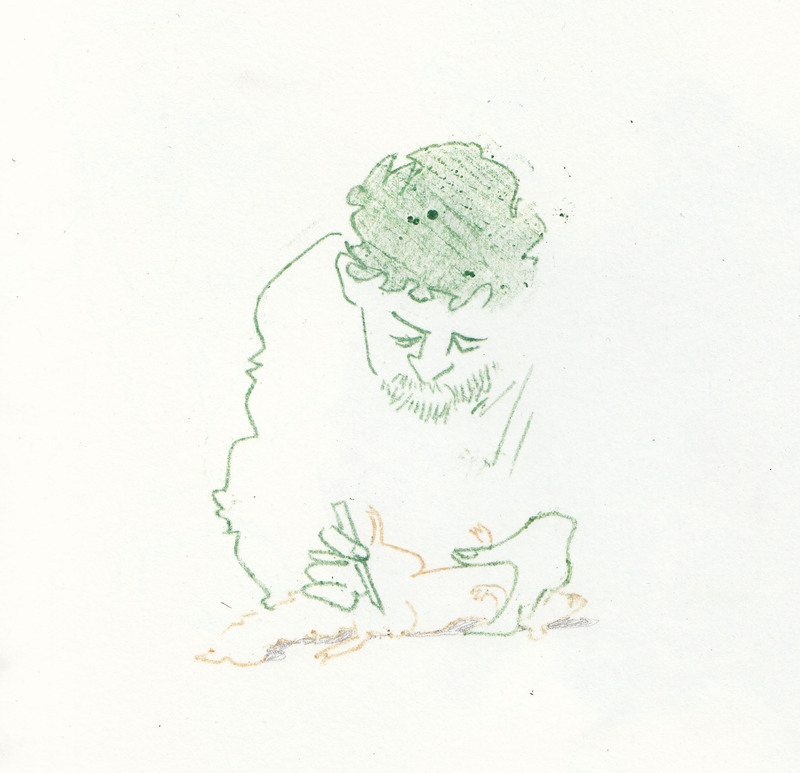 Perhaps I am simply a recorder of things, a diarist, a reportage artist – am I a storyteller? That remains to be seen… but I am trying to have faith and yet, for the moment, not always managing to do so. If you had a copy of the Butchers for sale I would buy it, its wonderful! Thank you Stephen, I am afraid that it’s in a sketchbook – but I am planning on going to draw it again when it’s open, so I’ll do that outside the sketchbook and you can see how you like it? It’s not hard to get a good quality print made from a scan, and quite affordable to – so thanks for saying how much you like it! I don’t think you need to represent every brick and tile. Excellent Natalie, many thanks. I know time is pressing with your course but would love a copy.